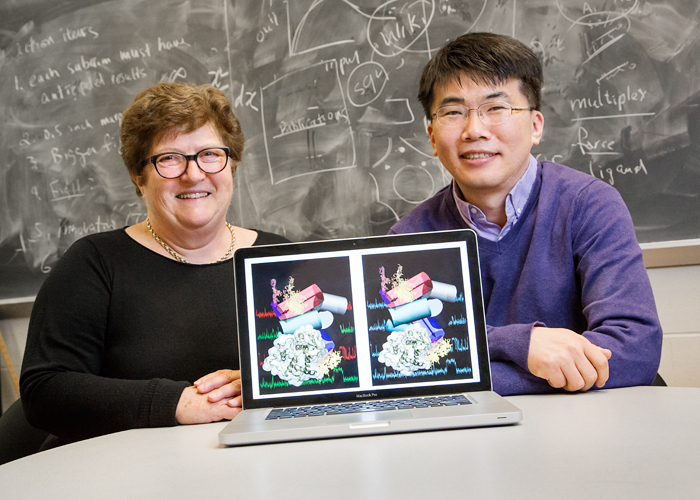 University of Illinois chemistry professor Zaida Luthey-Schulten and physics professor Taekjip Ha led a study of how the ribosome assembles itself. CHAMPAIGN, Ill. — Ribosomes, the cellular machines that build proteins, are themselves made up of dozens of proteins and a few looping strands of RNA. A new study, reported in the journal Nature, offers new clues about how the ribosome, the master assembler of proteins, also assembles itself. In 2000, scientists published precise atomic structures of intact ribosomes (a feat that won them a 2009 Nobel Prize in chemistry) and for decades researchers have delved into the mechanics of ribosome function. But scientists have much to learn about how the ribosome itself is built from its component parts, Luthey-Schulten said. All ribosomes consist of two subunits, each a cluster of precisely folded proteins and RNA. The team focused on the small ribosomal subunit of the E. coli bacterium. It is made up of about 20 proteins and a ribosomal RNA (known as 16S). The researchers labeled one of those ribosomal proteins. Known as S4, it is thought to be the first to interact with the 16S RNA during assembly. They also labeled two sites on the 16S RNA. Each label fluoresced a different color, and was designed to glow more brightly when in close proximity to another label (a technology known as FRET). These signals offered clues about how the RNA and proteins were interacting. The team was most interested in a central region of the 16S RNA because it contains signature sequences that differentiate the three cellular “domains,” or superkingdoms, of life. Previous studies suggested that this region also was key to the RNA-protein interactions that occur in the earliest stages of ribosome assembly. Using a “computational microscope,” the team compared data from their FRET experiments with an all-atom simulation of the protein and RNA interaction. Their analysis revealed that the S4 protein and the 16S ribosomal RNA were a surprisingly “dynamic duo,” Ha said. The protein constrained the RNA somewhat, but still allowed it to undulate and change its conformation. The team found that the S4 protein tends to bind to the RNA when the RNA takes on an unusual conformation – one not seen in the fully assembled ribosome. This was a surprise, since scientists generally assume that ribosomal proteins lock RNA into its final, three-dimensional shape. “We found that the S4 and RNA complex is not static,” Ha said. “It actually is dynamic and that dynamism is likely to allow binding of the next protein” in the sequence of ribosome assembly. This intricate dance of molecules leading to the assembly of ribosomes occurs very fast, Luthey-Schulten said. Knowing how the ribosome is put together offers new antibiotic targets, said Ha, who is a Howard Hughes Medical Institute investigator and a co-director of the Center for the Physics of Living Cells at Illinois. Luthey-Schulten and Ha are affiliates of the Institute for Genomic Biology and the Beckman Institute for Advanced Science and Technology at the U. of I. The National Science Foundation and HHMI funded this project. Editor's note: To reach Taekjip Ha, call 217-265-0717; email tjha@illinois.edu. To reach Zaida Luthey-Schulten, call 217-333-3518; email zan@illinois.edu. The paper, “Protein-Guided Dynamics During Early Ribosome Assembly,” is available to members of the media from the U. of I. News Bureau.